When you find something you truly love to do, something that challenges you, you find yourself in flow. For me, the first thing I think about is running down the side of the mountain in Chile last year. The climb up the mountain at 10,000 feet is the anxiety, the run down the other side is full immersion in joy. 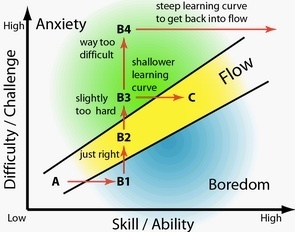 What are you focused on that provides you both positive anxiety and puts you in flow?